The accounting landscape shifted following the era of global financial crisis and accounting information continues to play a vital role. 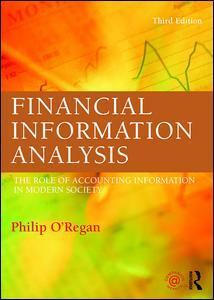 Philip O?Regan?s authoritative textbook provides readers with the tools and techniques to fruitfully analyse accounting and financial data. Updated to reflect changes in corporate governance, regulatory frameworks and new forms of IFRS, the text continues to shed light on the growing emphasis placed on the role of accounting information in formulating financial strategy. Features which add value to this third edition of Financial Information Analysis include case studies in every chapter with numerous supporting articles from the major financial presses, questions for review, and a comprehensive companion website. This essential textbook is core reading for advanced undergraduate and postgraduate students of finance and accounting.